On April 28, External Affairs Minister G.L. Peiris telephoned Tamara Kunanayakam, Sri Lanka’s Permanent Representative to the United Nations in Geneva, and instructed her to leave. She was told to choose between Brazil and Cuba for her next posting. The development comes hot on the heels of the US-led resolution on Sri Lanka being passed at the UN Human Rights Council. In an unprecedented turn of events, Kunananayakam has refused to comply. In an interview with LAKBIMAnEWS she said she has no intention of leaving. QUESTION:There are reports that you have resigned from your position in Geneva; that you have been asked to choose between Brazil and Cuba as your next posting. Have you resigned and will you leave Geneva to accept one of these postings? ANSWER: Absolutely not! I have not resigned from my post in Geneva nor is it my intention to do so. It is inevitable that my removal from Geneva will be interpreted as a sanction by the Sri Lankan people and also by the diplomatic community in Geneva. It will send the wrong signal to our friends and allies in Asia, Latin America and Africa, who have expressed their support and solidarity toward Sri Lanka. They might think that the decision was the result of external pressures, a punishment to those in Geneva who dared resist. A sanction would also be interpreted as a shift in policy that may cost Sri Lanka the dignity and self respect gained at the recent Session. Under the circumstances, it is unlikely that my transfer to Brazil or Cuba will be looked upon kindly by either Brasilia or Havana. They will not appreciate their country being considered a punishment station. Were you in any way to blame for our defeat in Geneva? If not, why are you being targeted for a transfer? I would like to insist that ours was not a defeat. A battle fought in the interests of people and country, on the basis of principles, can only result in a moral victory. We grew in self respect and dignity and won the admiration of those in the developing world for having stood up for what is right. I am convinced that, if we do not let our friends down and continue with the positive measures taken inside the country and cooperate with the United Nations, which, by the way, belongs to all of us and not just to a handful of big powers, then we can only go from strength to strength in the battles ahead. If I was to be transferred in the wake of a public debate on responsibility for what has been presented in certain quarters as a national defeat, it will certainly be interpreted – and quite rightly – as a sanction. I was only carrying out the foreign policy orientation and instructions of our president and his minister of external affairs. I am satisfied that I carried out my duties conscientiously, with the best interests of the Sri Lankan people at heart and to the best of my abilities, placing at their service my long experience and knowledge of the UN System, more than 10 years of which I spent in the Office of the High Commissioner for Human Rights. I do not have a personal agenda, my motivations are not career, fame, or fortune. I have worked on the basis of principles rather than devious schemes and manoeuvres, pettiness, and mediocrity. I believe this has been appreciated by many in Sri Lanka and in Geneva, where we have succeeded in winning new friends and allies. Was the weakness of our diplomatic strategy a reason for the passing of the US resolution? After Ambassador Dayan Jayatilleke’s recall in 2009 and his remarkable contribution to defeating a Western-backed resolution against Sri Lanka at the Council’s Special Session in 2009, no efforts were made to build upon the capital he left behind. At the time of his departure, Sri Lanka could count on the support of the overwhelming majority of its natural allies in Africa, Asia and Latin America. But, then we abandoned the principles of solidarity and reciprocity that is so important to our work at the international level, and ours became a pursuit of selfish interests. In formulating our strategy, it is important to remember that only a Western country will submit a resolution against Sri Lanka and that its defeat will depend on the support received from Africa, Asia and Latin America, with whom we share a common history of colonization, of struggle, and principles on which these are founded. Let us not forget that these countries make up 34 of the 47 member States of the Human Rights Council. Secondly, we have allowed ourselves to be placed on the defensive. An offensive strategy would have permitted us to challenge our opponents, their failure to respect international human rights and humanitarian law, instead of us becoming their victims. We should have been in a position to expose their hypocrisy, their double standards. We should have been ready to engage in the battle of ideas. There is plenty of evidence to challenge the independence of so-called NGOs campaigning against Sri Lanka. Human Rights Watch, Amnesty International, Reporters without Borders, International Crisis Group, and Freedom House, are directly linked to USAID and the National Endowment for Democracy or NED, which, since the Reagan years, receives millions of dollars to do what the intelligences services cannot do. We could have challenged their status in the United Nations and disarmed them! Thirdly, over the past years, we should have been building a broad-based alliance with developing countries on the basis of common interests and common principles. Sri Lanka is admired and respected in Asia and Africa for the role it played as promoter of the Non-Aligned Movement in the 50s and 60s. Our concerns remain the same. Our struggle continues to be ensuring respect for sovereignty, independence, territorial integrity, non-interference and intervention in internal affairs. In the West, we should have multiplied our efforts to neutralize governments by building links of solidarity with the people. We all know that the interests of the ruling class are not necessarily those of the people. This is increasingly evident as the economic and financial crises intensify. We also know that the interests of the US and its European allies are not necessarily the same. We should have been in a position to play on all these contradictions. What other measures will now follow the passing of the US resolution? This resolution is only a first step. The Council has called on the government to implement the LLRC recommendations and to take additional steps to address accountability issues. It has also encouraged the government to accept advice and assistance from the Office of High Commissioner for Human Rights, which, in turn, has been asked to report on the steps taken to the March 2013 session of the Human Rights Council. If the High Commissioner does not believe that the government has satisfactorily implemented the resolution and if, at the same time, our opponents can make the case that the government is unwilling or incapable of protecting its own citizens, the Council may decide that there is a need to establish an independent international investigative and monitoring mechanism. Key to the process will be the Universal Period Review of Sri Lanka undertaken by the Council in November this year. We will have to demonstrate that the government has fulfilled the commitments it undertook in 2008, that civil society was engaged in the process, and that it cooperated with UN mechanisms in fulfilling its international obligations. The outcome will be crucial for Sri Lanka. All these, together, will enable us to mobilize the support and solidarity needed both internally and internationally. Cuba is an example of a small nation, with half the population of Sri Lanka, and subject to a US embargo for over 50 years, that has been successful in resisting the constant threat of intervention thanks to the unity of its people and international solidarity. Divisions and internal contradictions will always be exploited by our opponents to their advantage. The recent session of the Human Rights Council is a demonstration, and so is our almost 500 years of colonization. Do you think that if the ground situation in Sri Lanka had been better at the time the resolution was taken up, Sri Lanka might have fared better? As I remarked earlier, there is much hypocrisy and double standards in the Human Rights Council. It is clear to all that the motivations behind the US move had nothing to do with human rights in Sri Lanka or the wellbeing of its people. In only a short period of three years, Sri Lanka has done remarkably well in terms of progress than any other country that has suffered decades of conflict. Much of Latin America and Africa, even three decades later, is still grappling with the aftermath of military dictatorships and internal conflicts, mostly backed by the external forces that are, today, targeting Sri Lanka. Then, they argued that accountability would hinder reconciliation; today, they tell us that there can be no reconciliation without accountability. Were we being complacent in assuming India would support us no-matter-what? We all have our national interests and ambitions, and these depend on our historical, cultural, social and economic specificities, and our geostrategic location. Politics, even in the family, is based on the exploitation of internal contradictions and divisions. A clear strategy, internal unity and cohesion, are crucial to ensuring that India is on our side. Some of us played into their hands. If past mistakes are to be avoided, we should do some self-criticism rather than point fingers at others or look for scapegoats. We must be capable of identifying our real enemies are, and also our friends! Is there danger of another resolution being fielded? If so, where would it come from – the same source? Obviously, the US would not have been able to dominate the world without a clear, well thought-through strategy. We can, therefore, expect that the next step will come from the same source and it is likely to be in the form of another resolution. Resolutions are, however, only a means to an end. There is no doubt that the real objective is to ensure that Sri Lanka’s leaders fall into line! The geostrategic importance of our country is well known and the interests of our people, who largely depend on the domestic economy, is in contradiction with that of international finance. With the intensification of the economic and financial crises, efforts to guarantee access to the wealth and resources of other countries and peoples are also increasing. The multiplication of external military interventions is part of that process. I admire this lady for standing up against the powers that be. The reasons given by her are valid and need to be considered seriously for the sake of our country. As for the learned Prof who gives a phone call and asks her to make a choice, all his learning and credentials are in vain as he continues to perform the job of External Affairs Minister in the manner of a peon carrying out the orders of the sidekicks of the President. My sympathies to him. Mr. Bono It’s not her name, something is going on. Only Lord Al Mighty knows. It is interesting note that Tamil separatist propagandists who all these years kept screaming that no Tamil could get in to a position of authority in GOSL or in the SL Armed Forces, all of a sudden find many who have done exactly that! So there were Tamil Major Generals, Tamil Wing Commanders, Tamil Foreign Ministers, and Tamil Ambassadors within the GOSL ranks. It is usual that if something bad done in hads of any Sinhalese, it is a matter of an individual of this country. But, if somthing happen with the hands of any minority, the perception is towards the whole community not against that individual. The Sinhalese of this country still considers the minority as ‘others’ in thier daytoday life. language ‘Eyala, ‘Egolon’ to denote minorities. But to denote the Sinhalese they use ‘api’ which in a way it denotes the ownership of this country belongs only to Sinhalese. this is natural reflection of how thier mind is set. So, Thamra should understand the ‘importance of being Sihalese’ in Sri Lanka. otherwise she has to change her name as suggeted. Good Interview! I do hope the Lady, who is a true Sri Lankan, does not become another victim of the many diplomatic blunders and stupidities of the Rajpaksa-Regime. A minor mistake: Zbigniew Brzezinski was advisor to President Carter; he does however support Obama. Majority, is almost finished with the British favourite minority. Now towards the next..? Not willing to share the Mango cake huh…!! Mrs Kunanayakam is absolutely right about US hypocrisy in the UNHRC, as its attempts to subvert a resolution on Israeli settlements voted in favour of by 36 members at the very same UNHRC session – with the sole dissented being the US – reveals. 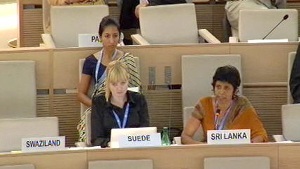 Having pressured many countries to either vote for, or abstain on, the recent UNHRC resolution against Sri Lanka which it sponsored, the US is now attempting to convince the Human Rights Commissioner to postpone the implementation of the resolution passed in the same session which sought to establish a panel to investigate Israeli settlement activities in the Westbank. The US is seeking to ‘postpone the establishment of the panel to the latest possible date, hoping this will lead to the unofficial burial of the matter’. It should be remembered that unlike the resolution on Sri Lanka, 36 countries voted in favour of the resolution against Israeli settlement activities, with US being the sole dissenter. As if that was not enough, now they are trying to subvert the wish of the overwhelming majority of the Council. This is exactly what the US attempted to do with the Goldstone report, which its ambassodor to the UN, Susan Rice said should ‘disappear’, and was characterised by Eileen Donahoe (US ambassador to the UNHRC who introdiced the anti-Sri Lanka resolution) as ‘undermining the cause of peace’. WHAT HYPOCRITES!!! DBS, if you know the contact details of Mrs Kunanayakam or Prof Wijesinhe, please refer them to the article below. Mrs Kunanayakam should inform her colleagues from the Arab League, the African Union, the Organisation of the Islamic Conference and other like-mindeds from Asia, Africa and Latin America of this deplorable attempt by the US to subvert the intention of the UNHRC on Israel; in doing so, she will be highlighting the hypocrisy and double standards of not only the US but also the High Commissioner for Human Rights, who will surely follow the US directions to the letter. Israeli Foreign Ministry officials believe the aim of Obama administration pressure is to postpone the probe until at least after the presidential elections in November. The Obama administration is trying to delay the establishment of a panel appointed by the United Nations Human Rights Council to investigate the issue of Israeli settlements in the West Bank. A U.S. official conveyed messages to UN Human Rights Commissioner Navi Pillay in the last few weeks, asking her not to advance the matter in the near future. According to the text of the decision to establish the panel, it is meant “to investigate the implications of the Israeli settlements on the civil, political, economic, social and cultural rights of the Palestinian people throughout the Occupied Palestinian Territory, including East Jerusalem.” However, the UN Human Rights Commissioner has yet to formulate a clear mandate for the panel and has not appointed a chairman or members. Foreign Ministry officials noted that the U.S. wants to postpone the establishment of the panel to the latest possible date, hoping this will lead to the unofficial burial of the matter. However, the assessment is that it will not be possible to prevent the establishment of the panel, so the aim is therefore to delay it until at least after the U.S. presidential elections in November. On March 30, a week after the decision by the UN Human Rights Council, Deputy Foreign Minister Danny Ayalon traveled secretly to Washington to meet with his U.S. counterpart Bill Burns. Ayalon asked for help in thwarting the establishment of the panel and even suggested that the U.S. publicly threaten to quit the UN Human Rights Council if the panel is established. The Americans did not respond to that threat, as they view membership in the UN Human Rights Council as a central issue in the foreign policy of the Obama administration. However, the Americans agreed to pressure the UN Human Rights Commissioner on the date of the establishment of the panel and the mandate that it will receive. Following the UN Human Rights Council’s decision to establish the panel to investigate the settlements, Foreign Minister Avigdor Lieberman decided to halt cooperation with the UN Human Rights Commissioner and her staff and to boycott the proceedings of the UN Human Rights Council. A Foreign Ministry official told Haaretz that one of the people who tried to change Lieberman’s mind from taking that step was none other than Israel’s ambassador to UN institutions in Geneva, Roni Leshno-Yaar. Leshno-Yaar came to Israel several weeks ago for policy consultations, met personally with Lieberman, and tried to convince him to go back on the decision. Leshno-Yaar said that the damage of the decision would outweigh the benefits. Lieberman listened to Leshno-Yaar, but did not accept his view. Leshno-Yaar returned to Geneva and received written instructions to cut all ties with the UN Human Rights Commissioner and to not appear at UN Human Rights Council discussions. Consequently, much of the work of Israel’s envoy to UN institutions in Geneva was frozen in place. Incidentally, Leshno-Yaar will finish his role in Geneva in a few months and return to Israel to serve at the Foreign Ministry headquarters in Jerusalem as the deputy director-general of ties between Israel and the UN. Tamara changing her name alone to be a a sinhalese may not help. She must change her religion to Buddhism as SriLanka is a Sinhala Buddhist republic. This is Rajapakshas ‘Condom Theory’ at its best and what will be the options the not so fair lady have here now? obviously she will be lucky enough the MARA regime cannot send a notorious White Van to Geneve though dragging in with the position will make someone like Sajin Vaas to use a blackmail campaign in sinhala press and accuse the lady as a LTTE agent etc. So… this is what you have to pay for leting an unknown Sinhala MP, Mahnida Rajapaksha to sleep on her studio apartment in Geneva in believing he is for human rights. Madam K – your own human rights were challenged by the very same crusadors of Sri Lanka and lets take these Rajapakshas to Hague and share a cell with James Taylor. Sri Lankans must have loyalty on their country not on other matters. But nationalism ( any kind of ethnic group) is crucially impact on peacefull co-exsistence in the country. So. different kind of ethnic people who living in the country , must think their country first. It is possibly true that America’s real intentions in bringing the resolution against Sri Lanka has nothing to do with human rights or for that matter protecting minorities in the country. But that doesn’t excuse the fact that the Rajapaksa regime slaughtered thousands of innocent Tamil civilians, their fellow citizens, in the last months of the war, all in the name of defeating terrorism. All she is doing is attempting to protect the regime she represents with no consideration for those who were killed by the regime. And she claims it is a principled position? Please don’t insult our intelligence. Excellent piece.Thamara should be congratulated by all true Srilankans for her bravity, and courage. Your response should be treated as a brave indictment for those who masterminded the coup in the Colombo cabal. There are many sinister moves against Tamara , Envy,jealousy are only two of them . Tamara is one of our best diplomats . This is nothing to do with discrimination but one person who wants that positon wants to outsts her to get in there and spoil it for SL . You failed, please don’t talk of moral victories ! Even if the defeat was by one vote, it is still a defeat ! Mr Pro Bono Publico and others of your ilk who are either trying to arouse racism or simply not clever enough to grasp the internal power struggles in SriLanka, please note that this has nothing to do with being a Tamil or Muslim or Sinhalese. In 2009 when the first resolution against SriLanka was brought, the Sri Lankan representative was Dayan Jayatileka, a sinhalese. Sri Lanka won hansomely but Dayan Jayatileke was transferred out within a short period after the victory. In both these instances it was Prof.GL Peries who took these decisions. Is something wrong with GL Peries? The President needs to investigate. “We grew in self respect and dignity and won the admiration of those in the developing world for having stood up for what is right.” This is a delusion not only Tamara other Sl diplomats are having if not why there have been so much of protests and denouncements by the ministers and thugs in ministerial monks robes.“ours became a pursuit of selfish interests”. This is and was the truth. “Secondly, we have allowed ourselves to be placed on the defensive. An offensive strategy would have permitted us to challenge our opponents, their failure to respect international human rights and humanitarian law, instead of us becoming their victims. We should have been in a position to expose their hypocrisy, their double standards” We could have challenged their status in the United Nations and disarmed them!”—We are begging from them for Alma. Then why not you bring a resolution against these countries ? Why did not you do it yet??? Instead just using filthy words by your thugs in ministerial robes to abuse western ,UN, diplomats. Theses action will certainly give respect the Srilankan people. US is abusing human rights so are we is this going to be your defense madam??? Was this Buddha’s moral teachings?? The real morality is weather our Government did/ and still doing abuse of human rights of its own civilians and journalists. “ Didn’t Zbigniew Brzezinski (advisor to President Obama) argue that control over Eurasia was key to ensuring US global supremacy?” Sounds familiar –CONTROL OVER TAMILS/MINORITIES ENSURES MAHAVAMSA SINHALA BUDDHISTS SUPREMACY IN SRILANKA!!!!! Ranjan, Toronto , Ever heard of seasoning with salt and pepper to flaver the food( sesoning will not affect the nutritional value of the food or relieve ones hunger mate). Tamara has spoken well.We need more people like her in the diplomatic community.It will be a pity if she is moved.Our external ministry need leaders who are intelligent,unbiased and not selfish. Some nuts have started projecting this absurd political decision as an ethnic and religious issue. Shame on those fanatics! They are equally responsible for misleading our people. I am sure Tamara’s intellectual comprehension is far broader and sharper than these fanatics. Tamara, whole of Sri Lanka, except two three ambitious inefficient persons in the foreign ministry and an incapable politician, are with you. We are saddened and dismayed by this decision. We hope that the political leadership in the country will have the far- sighted vision to revoke this shorted sighted- politically motivated idiotic decision that will have far reaching consequences in terms of dignity, integrity and self respect of the country in the eyes of international diplomatic spheres. We very sincerely believe that only very few Sri Lankan diplomats of present such as you and Dayan have clear understanding of politics of so-called independant world bodies and western strategies and constipations against weaker nations. Even fewer have the vision, courage and ability to counter these western constipations against the smaller and weaker nations. We believe only Tamara and Dayan can serve the best interest of the county at Geneva at this critical juncture. Don’t be hurt Tamara, we all Sri Lankans you are with you. Pro Bono, Please do not blame all the Sinhalese for mistakes of a few. Majority Sinhalese should not be blamed for the acts of few of the ungrateful rulers. See what happened to General Fonseka. We hope that the political leadership in the country will have the vision to revoke this shorted sighted- politically motivated idiotic decision that will have far reaching consequences in terms of dignity, integrity and self respect of the country in the eyes of international diplomatic spheres. We very sincerely believe that only very few Sri Lankan diplomats of present such as you and Dayan have clear understanding of politics of so-called independent world bodies and western strategies and constipations against weaker nations. Even fewer have the vision, courage and ability to counter these western constipations. We believe only Tamara and Dayan can serve the best interest of the county at Geneva at this critical juncture. Don’t be hurt Tamara, we all you are with you. Please leave her alone. She also same as Kadiragamar. Tamils now can talk of R. Sambandan, man who hold and wave Sri Lankan Lion flag at May Day rally at Jaffna. He said to visiting Indian parliament deligation he borned as a Sri Lankan and he wants to die as a Sri Lankan. Actually the Minister and the other jokers should resign for the failures at GENEVA….they mucked up the whole issue by being over confident….win at whatever the cost….Intimidations…. Unfortunately this is Sri Lanka Ruled by a President whose only objective is to be in power at whatever the Cost… So as the Leap FROGS……remember the 18th amendment to the constitution….Prof G.L.Peiris was the architect of this manipulation…other than that what are his accomplishments in political life up to now ? zero… and what will be his accomplishments ?….under the present position the Govt is placed with the international community….it is very unlikely that he could do anything of worthy….so he has now become a spent force…. As his objective is also to be in power ….he will not resign….but hang on .. So he will be the Grooming or Training Minister .. for Namal to be the future Foreign Minister…he will have no option….he knows what is to come … As such he perhaps to regain the position before the next UN session want to throw out one of THE Brilliant Diplomats the Country has at the UN….. They all know what happened at GENEVA was just kindergarten stuff…..not professional at all ….it was a mess You would have handled it better if left alone…….THEREFORE DO NOT RESIGN…. One will reap what he sows…..let him go down the history as an Idiot who sold his conscience..
Tamil’s leader has raised Lion Flag….Is there any Sinhalese leader has the guts to raise Tiger Flag? I am an ordinary simple Sri Lankan.I belong to the yesteryear. I witnessed the Independence of Ceylon in 1948 at the Galle Face Green. I had great hopes for Ceylon. But as the years rolled by, I saw and now see that Ceylon has slided abysmally into an abyss and I do not see a light at the end of this tunnel. This Country going by its history after Independence has demonstrated its puerile,frivlous non cohoherant attitude. This Country is amassed with rhetoric it has no bounds. This Country has always said one thing but acted to the contrary. I am surprised that you, after all this international exposure you did not see the writing on the wall. I have had the bitterest experiences in this beautiful peaceful Country. My brother was killed in the first riots in 1958, because he was not conversant with buddhist stansas. His killers were pardoned by the SLFP Govt. I have witnessed several riots and uprisings. Hundreds of bodies floating in the Mahaveli and the Kelani rivers. I saw how “BANDA” twisted his “OXFORD” into a mediocre educational system. I feel sorry for you,and for all your expectations similarily to many other rational educated sinhala Buddhists. Some who are serving this Government because its their profession and responsibility. If time and space permits I can prove to you that you blindfolded accepted this appointment not knowing how perilous this journey would be. Its better you leave this den of thieves, unscruplous and unprincpled. I wish I knew you personally to tell you more. Dont fool yourself. You are not defending Sri Lanka. You are defending war criminals in Sri Lanka. You will be remembered in history for this. srilankas no 2 order is pending, no 4th oredr is negated, no 459th order is rejected by no460. Is this smell of failed state? After becoming a SLDiplomat, she changed her ‘tune’. I have always felt disgusted about been a sri lankan particulaly a sinhalese………. Tamara keep fighting…we are always with you….I think this is all that sajin vass fellows work who has no foreign service qualifications…. Not sure about your current stand or, rather stand off. What you have been saying is alright, and you show your loyalty to your beloved country and its people. However, all becomes undone if you go against your employer, not accepting their orders. There were instances where persons that were more loyal than you did defy the orders of the government of the day, and faced its brunt. The recent example was Sarath Fonseka. You could hold your position only at the pleasure of the State. GoSL, or GLP counting his own number of days at the helm, seems to be more generous towards you, providing cool rooms in two countries for you, which is far better than the luxury afforded for our hero SF. Swim with the flow, accept the offer as this is the path of least resistance. Do not get carried away with the advice like ‘fight to the end’ and etc. Not sure about whose end. My reading of the situation here is GoSL does not trust you, they prefer you to be posted to Cuba so damage you could do collaborating with someone, in their view, will be negligible. Cuba by default supports any country that go against the USA, so the good thing about this transfer is your works cut out here. Imagine for a moment that you are still in SL and factor the white van showing up nights into your decision, then arriving at a decision becomes less complex, and much more mature. Also, I could not agree with you saying SL’s poor showing at Geneva was due to its defensive approach. I wished you could have gone on offensive and debated comparing, kind of “you did that, and what is wrong with if we did this, is not it hypocrisy”. In doing so you could have put our guys on the rope. Luckily our Mohan Peries, sensing the danger, went with “are not we all friends?” slogan. In my view, and I might be wrong, the flaw with your kind of approach is you could win the battle but loose the war. Hope you get it. I’ve been saying from the very beginning this lady should be looked at tamil first then only Sri lankan but many here were very critical of that I guess now they can see and understand for themselves. This is a grave mistake and a mistake to remember. Tamara You are brilliant. You are way too professional and intelligent to be part of the GoSL team. We need professionals like you leading this countries affairs at the crucial time of history. Continue to stand by your country and your principles. We are proud of you. Never seen such intelligence among the diplomats from Sri Lanka for some decades. Who can get the pea brains away from the helm of authority in external affairs ?? I am surprised to see a person with such high calibre and hands on experience on global politics simply didn’t understand the local politics of Srilanka. You may want to get expert advise from people like Walter who commented on this article to educate yourself on Srilanksn Politics, which is full of criminals, thugs, back stabbers, human right abusers, ………..etc. Walter! I salute you Sir to take time to write this wonderful piece of advice to Ambassador Tamara Kunanaykam. I would like people like you to write more on the historical background of the thamil or minority struggle in that beautiful island for years to educate younger generation of Srilankans to understand why that country is far behind on the infrastructure and human resources development compare to its rich history. Tamil’s leader has raised Lion Flag….Is there any Sinhalese leader who has the guts to rise above the lion Flag? So this “Malinga Bandara” represents all Sinhalese? Can the Sinhala people regard your views as being representative of all Tamils? Tamara may be brilliant. But she has sold her soul by defending war criminals!! I hope other people who are also in the similar situation will learn from her bitter experience and refrain from supporting the war criminals and will have the courage to stand for justice. Pro Bono, was Dayan Jayatillake fired from the same job as Tamara because he too was a Tamil? To point to past racism as proof of present racism is as idiotic as calling an apple an orange because there are many orange trees. She’s been expelled!?! DBSJ PLEASE TELL US HOW THIS CAME ABOUT…. I just read that Tamara has been transferred to Cuba. Dear DBSJ is there anyone in Sri Lanka who can stop this folly? Barbara Tuchman wrote a popular history book”The March of Folly”. If that is the case,then srilanka has to be extra careful here.It should see that there are no human rights abuses and the peoples well being is not questionable in the international sphere. That way the US will have to scratch its head and wonder what to do next to achieve its ulteriour motives.We cannot take the US head on,so we have to use our brains instead.Remove all excuses that the US will have to interfere in our country and defeat it that way.